Not only here on the blog but also on my Instagram feed it was a bit quieter in July although it was in my life haywire. I suppose most of you have already noticed on my Instagram that I’ve been pretty sick for the last few weeks. In short: I was picked up by emergency ambulance, had to undergo many examinations, one of them had serious side effects, I had to cancel my vacation, lost a lot of cash and the worst summer of my life so far. If you are interested in the whole story, you should take a closer look at my Instagram feed, because everything is written down in detail. Well it was only a month, unfortunately one of my favorite but there is still the August and I make it to my month. One and a half week ago I was fortunately healthy again, yay. Yesterday evening I came back from Ibiza, which was just fantastic – but more in another post. At the end of the week, I will visit my family in Switzerland again. So, as you can see, I’m going to pick up everything I missed in July in August. Since, as mentioned above, it was quieter on my Instagram profile, it is not far away that fewer outfits have come together. The first one is pretty simple. It only consists of sunglasses and a zip hoodie by Baby Milo (part of A Bathing Ape (Bape)). Of course, I wear something under that, a dress with a floral pattern, however, you can not really see it. Also, I wear shoes that you can not see, which would have either been Nike Janoskis in black or Old Skool Vans – one of my two everyday models in any case. This was an outfit, which I had worn to work and the picture was shot at the station, just moments before I got into my train home. too wild to last, too rare to break. This picture was taken when Tristan and I were on our way to friends – we had a barbecue. The mood in this field was just incredible. So I stopped my bike and “forced” my boyfriend to take a picture of me. A short time later everyone could see it in my Instagram feed. My pose is not the best but, as I said, the mood is magical. 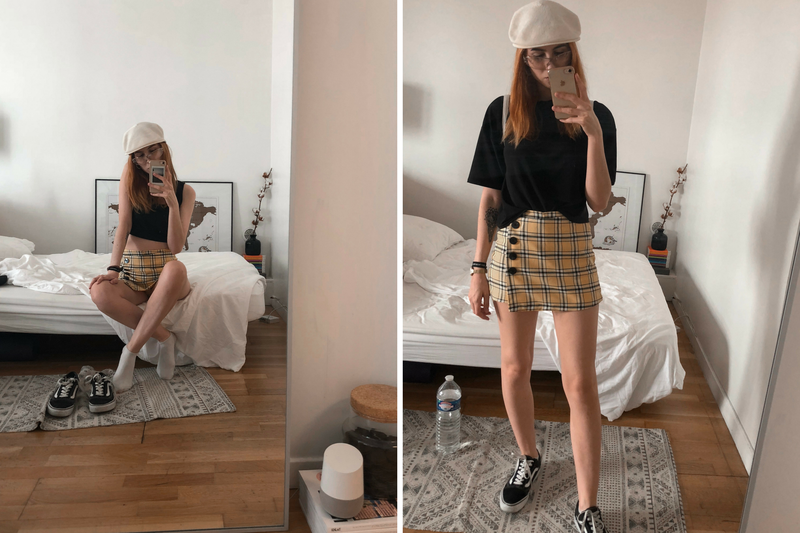 Even if you can not see the outfit well… The top is from Monki, the pants from Topshop and yes I’m wearing a beanie, that’s from Sneaker’n’Stuff. This is the only picture that was taken of me during my stay in Paris. I was only very, very rarely outside and usually not dressed instagrammable. Well, who’s getting dressed when he’s feeling so bad that you feel like you’re dying?! Anyway, the top is from Urban Outfitters, the bag from Supreme (I borrowed it from Tristan), the shoes are from Vans and the sweet plaid skirt is also from Urban Outfitters. I’m just totally into checked skirts, I was into them already a few years ago and now it’s time again. The picture below is, as you can see, again with a plaid skirt. This picture was probably the most popular of the month (I just do not take it personally that my head is not on it), but I can understand it. The skirt is just amazing. If I had not bought it already at Bershka, I would do it at the latest after seeing this picture. The skirt totally reminds me of the movie Clueless, where Cher wears a similar one. Ohwyouknow is a Berlin and Zurich based fashion and lifestyle blog. It´s written by Sarah Kuhn a 23 years old girl who loves new adventures all over the world. karierte röcke sind zeitlos, ich finde die auch sehr cool. Don't forget to put on the post notification to stay up to date!